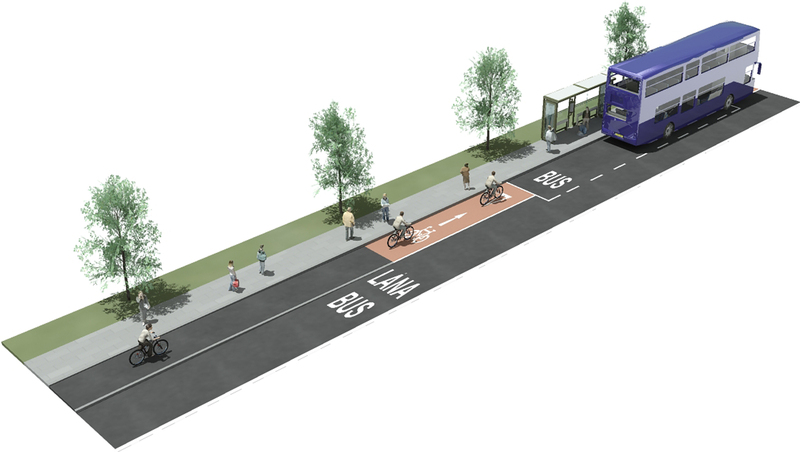 Existing guidance on the design and provision of bus stops, including their location, will be found in the Traffic Management Guidelines, and the Department of Transport Sectoral Plan prepared in response to the Disability Act, 2005. As noted in the Traffic Management Guidelines (ref. Chapter 15: “Public Transport”) buses must not only be able to move around the road network with minimum delay, but must also be able to pick up and set down passengers quickly and conveniently, if their full potential is to be achieved. Section 15.5 of the Traffic Management Guidelines deals specifically with bus stop design, and sets out advice under a number of headings, including location, layout, passenger access arrangements, street furniture and adjacent parking. Bus stations and bus stop design are included among the areas listed for action in the Sectoral Plan prepared by the Department of Transport as part of its response to the Disability Act, 2005. The plan requires that the needs of mobility-impaired persons must be taken into account when designing bus stops. 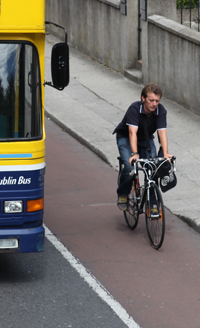 While it is recognised that it will not always be possible to provide conflict-free access for all users to and from buses and/or bus stops, there is an onus on the designer, nevertheless, to ensure in respect of mobility-impaired persons that access is facilitated, and that the highest degree of convenience is afforded them, insofar as is reasonably practicable. 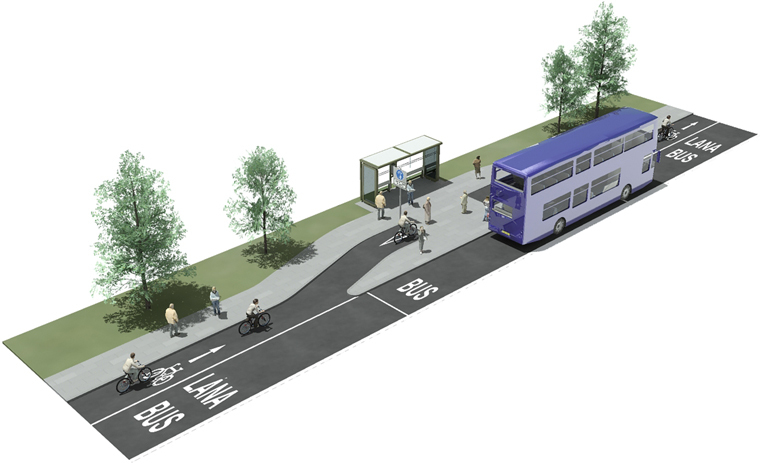 In this regard, bus stops are no different from other potential conflict locations such as junctions and pedestrian crossings. Like these, the conflicts can be addressed and managed by careful design consideration, and specifically by reference to the Principles of Managing Conflict. 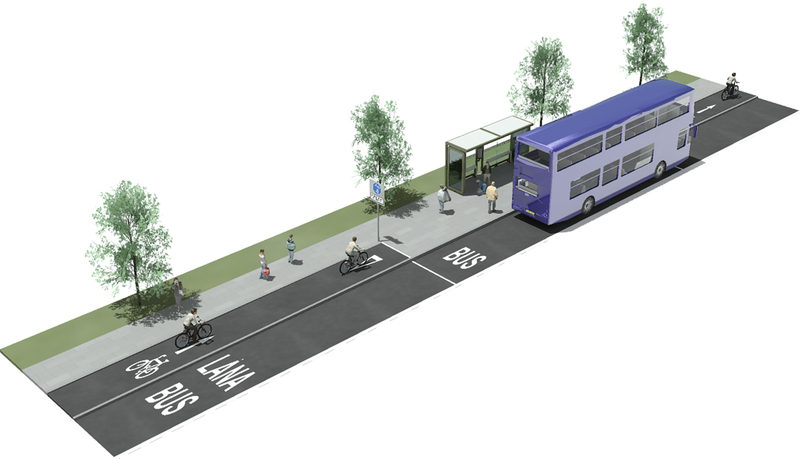 Regardless of which design is chosen, the bus stop arrangement should at least meet the following requirements. Bus/cycle interchange facilities (including secure cycle parking bays) should be provided at bus stops where the demand exists, or where it is felt it can be developed. 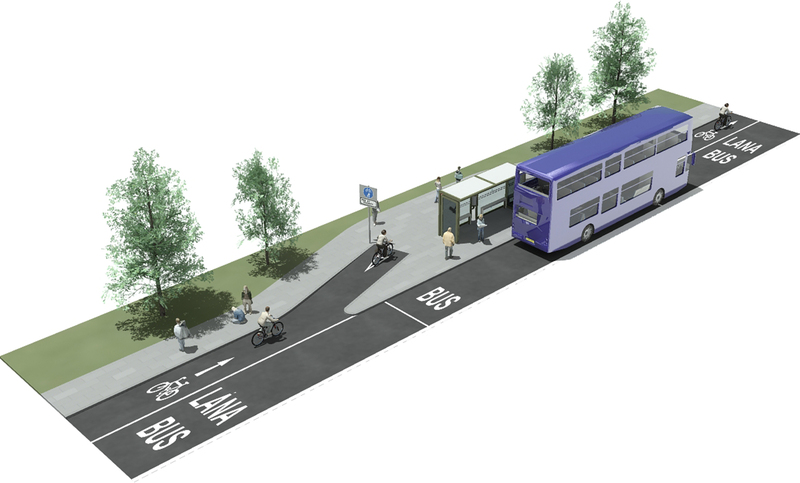 Pedestrian access to/from the bus stop? Passengers boarding/alighting from a bus? Passengers waiting for a bus? Buses pulling in and out from the kerb? Adjacent parking including passenger set-down/collection (kiss-and-ride)? The choice of bus options and the design issues associated with each are included below. There are three basic design-types. 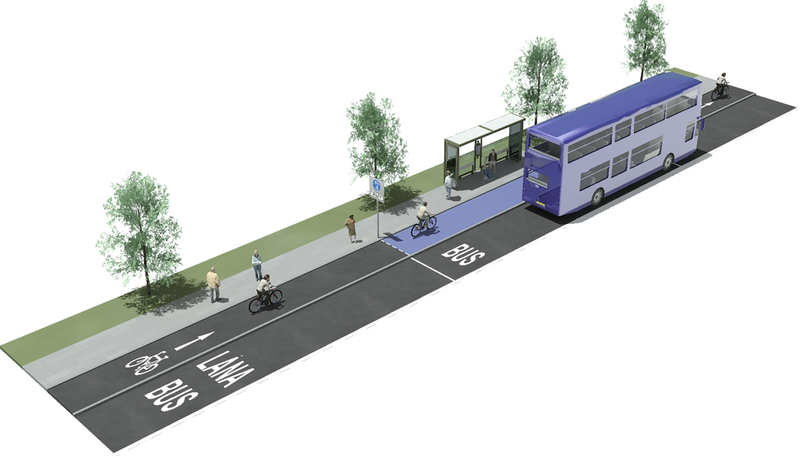 Bike yields priority when bus stops. Bus stop surface prone to deterioration. To preclude conflict between the bicycle and road traffic. Bike vs Pedestrian, Waiting Passenger and Boarding / alighting passenger in a shared space. If a) cycle approach speeds are high, b) there are too many pedestrians, or c) there is simply insufficient shared space, the quality of provision for both cyclists and pedestrians / passengers will be affected. The location of the shelter on the island requires more space. 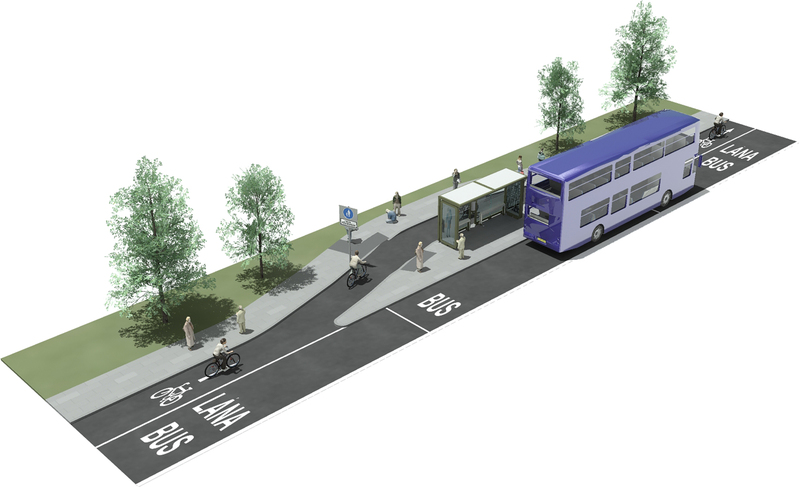 Ensure sufficiently wide cycle lane on bend as cyclists reposition beside bus lane, to ensure cyclists do not encroach into bus lane. Bus stop island width may need to increase depending on size of shelter, slope of ramps, presence of Kassell kerbs etc. 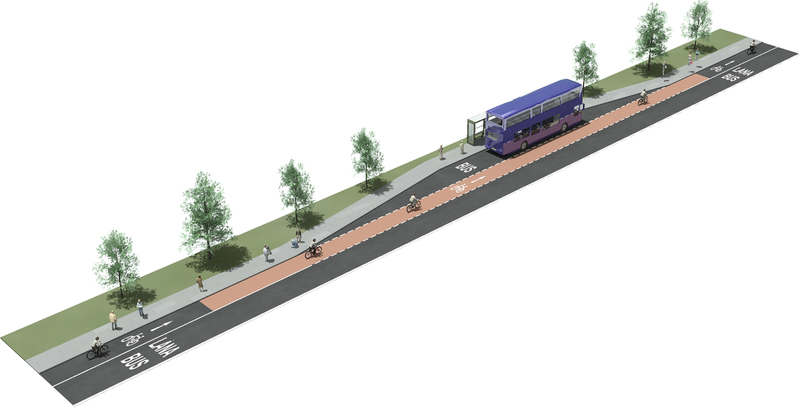 Ensure sufficiently wide cycle track on bend as cyclists re-emerge after bus shelter, to ensure cyclists do not fall into bus lane. By virtue of locating the shelter at the footpath, the conflict between cyclists and pedestrians may reduce (somewhat) to the times when the bus is actively at the bus stop. 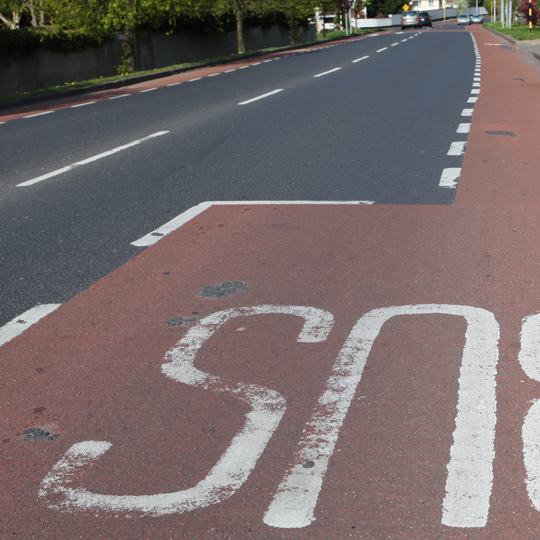 Important that design and markings ensure that cyclists slow down and yield to crossing pedestrians on shared space. Waiting passengers may spill over or stand on the crossing point with the cycle track. Bus bay design not suitable for articulated buses or Kassel kerbs. Risk of footpath obstruction where bus shelter is located on narrow footpath. Where Kassel kerbs are not necessary, and where a small step down from footpath onto cycle track is acceptable for access / egress to waiting bus. Bike vs. Passenger, when bus is present or approaching. 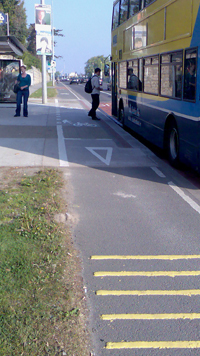 The stepped arrangement requires that bus passengers board and alight from the cycle track, a small step down from the footpath. 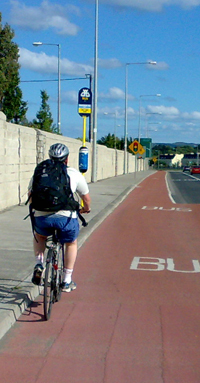 The step between footpath and cycle track should be obvious. A small bevel or dishing onto the cycle track may be possible. Clearly sign that cyclists yield (or stop) when bus is present.